Accident Attorney Victoria: Did You Take Photos After Your Accident? When you are involved in a car accident, it can shake you to your core. After all, any near death experience is sure to leave you shaken to say the least. This is even more true if you are injured in the accident. The moments after the collision occurs, it is not likely that you will be thinking rationally. However, remaining calm and taking quick action could mean the difference between your recovering any potential compensation you are entitled to. If for some reason you are unable to take the photos yourself due to an injury that sends you to the hospital, you may want to request that a friend or family member do so before the accident is cleared from the road. Regardless of the situation, continue reading below to learn more about how to handle a situation like this one. Why Is Taking Photos Of An Accident So Important? We know it might not be the easiest thing in the world to remember to take photos when you have been involved in an accident, but not remembering to do so could mean the difference between your claim being taken seriously or not. Photos are able to give proof that your testimony simply cannot. This includes who was at fault. When you are involved in a car accident, the first thing you are going to want to do is make sure you call the police. Seeing as how an accident report will have to be filled out by them before you can leave the scene, it’s important to make sure this is your first step. After you have contacted the police, you will want to call your attorney. This is especially true if you believe the accident was caused by the negligence of the other driver. While you are waiting for the police to arrive, try to gather as much evidence as you possibly can. This means taking photos of the scene of the accident as well as the area surrounding it. You will also want to make sure that you get the name and contact information of any other drivers involved in the accidents, as well as the makes, models and license plate numbers of any of the other vehicles involved in the collision. Take as many pictures are possible. Take photos from a number of different angles. Take photos of any injuries you may have sustained. This includes right after the injury as well as throughout the different stages of the healing process. 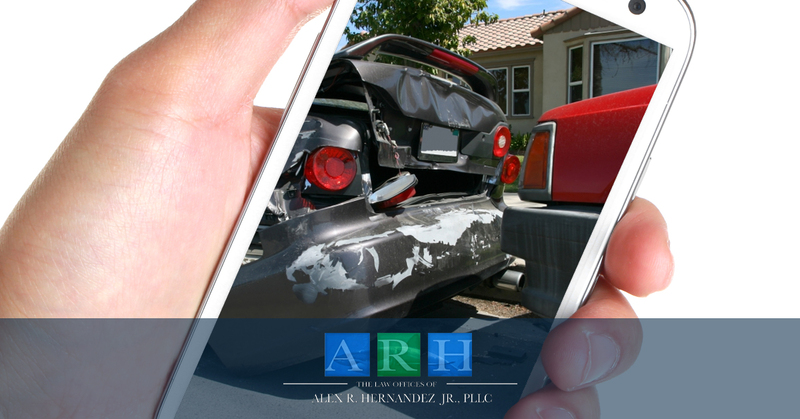 If you are injured in a car accident and you do not have a personal attorney, call the Law Offices of Alex Hernandez, Jr. in Victoria. We have been serving people in the great state of Texas for years and we know how to win a car accident suit. Contact us today to learn if we can assist you with your case.